We have to wait until 1631 to see the bulldog as a breed clearly distinguished from the Mastiff, when the word bulldog appears separately from the Mastiff in a letter written by an Englishman called Prestwich Eaton. Read more about the history of the bulldog. With the decline of bull baiting, in the early 1800s, bulldogs were no longer in demand and the number of purebred bulldogs began to diminish rapidly. If it had not been for a small group of dedicated fanciers, Bulldogs may have been lost forever. Fortunately, a group of true lovers of the breed got together, with the desire to retain the breed and all its good points. These points that were at the origin of the first bulldog standard showed the early relation to bull-baiting. Read more about the standard and its relation to bull-baiting. In 1864, the first Bulldog Club was formed with the motto 'Hold Fast'. It was under their auspices that the first Breed Standard was written. It was called the 'Philo-Kuan' Standard, after the nom the plume of the Standard's author, Samuel Wickens. In 1875, the original Bulldog Club replaced the first Bulldog Clubs. It was the forerunner of all dog clubs in the world, and existed even before the UK Kennel Club was founded. Members drew up a Standard similar to the Philo-Kuan, which is still used today and varies only slightly from the offical Standard. 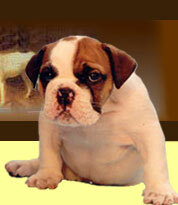 The exact origins of the Bulldog is still subject to controversy. What most breed historians and cynologists do agree on is that Bulldogs owe their name to the fact that they were once used to guard, control and bait bulls. Bull baiting was also considered a "sport" and enjoyed great popularity in the middle ages among noblemen and royalty. Dogs used for this "sport" become known as bulldogs. Their name referred to a function, long before any standardization in their physical appearance made them recognizable as a breed. 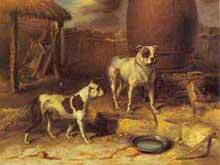 However, bulldogs had to be fit for the job, both in temperament, courage and morphology. dog, of a heavy and burdenous body, serviceable to "bait and take the bull by the ear", implies that that a similar dog did exist. The Bulldog Information Library 2003-2006 © All rights reserved.